We did two day tours with Traventuria during May (on consecutive days). There was some confusion when I booked the tours, on-line, as they scheduled the second tour a day later than I wanted and it needed to be shifted. My rating is based on two disparate experiences, which I will explain. Our first tour was the private day tour to Rila Monasatery with Ani as our guide and a young man as our driver (don't remember his name, he spoke very little English). This was a great experience (see my review of Rila Monastery for additional details) in large part due to Ani's knowledge and ability to place what we saw in a clear historical context. We stopped along the way to Rila for coffee and then to pick up cherries being sold along the highway. The experience at the monastery was quite memorable (a highlight of an extended trip to three countries) and the museum there was quite worthwhile. We shopped for a few crafts by the monastery and afterwards went higher into the mountains for better views. Then we stopped at a nice country restaurant for a late lunch (local trout), which was very nice, before returning to Sofia. This tour gets 5 stars plus. Highly recommended (you can do the Rila Monastery from Sofia very cheaply with the shuttle but I'd strongly recommend going with a good guide). Thanks, Ani! The next day were had a...We did two day tours with Traventuria during May (on consecutive days). There was some confusion when I booked the tours, on-line, as they scheduled the second tour a day later than I wanted and it needed to be shifted. My rating is based on two disparate experiences, which I will explain. Our first tour was the private day tour to Rila Monasatery with Ani as our guide and a young man as our driver (don't remember his name, he spoke very little English). This was a great experience (see my review of Rila Monastery for additional details) in large part due to Ani's knowledge and ability to place what we saw in a clear historical context. We stopped along the way to Rila for coffee and then to pick up cherries being sold along the highway. The experience at the monastery was quite memorable (a highlight of an extended trip to three countries) and the museum there was quite worthwhile. We shopped for a few crafts by the monastery and afterwards went higher into the mountains for better views. Then we stopped at a nice country restaurant for a late lunch (local trout), which was very nice, before returning to Sofia. This tour gets 5 stars plus. Highly recommended (you can do the Rila Monastery from Sofia very cheaply with the shuttle but I'd strongly recommend going with a good guide). Thanks, Ani! The next day were had a private full day tour to Koprivshtitsa, the Rose Valley and a Thracian tomb at Kazanlak. The tour turned out to be with two other couples, six people all together, with a guide who also drove (remember, we'd paid for a private tour). This is a long day trip (11 hours at least). The guide was a nice young man but I don't believe he'd been to either the Rose Valley or the Thracian tomb (he missed turns on the road for both and had to get directions from people on the street). 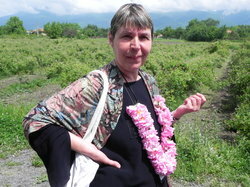 The village was very worthwhile, interesting, pictureque and we met some locals; and the drive through the Balkan Mtns. was pretty. The Rose Valley experience was also worthwhile as they were harvesting the roses and we stopped and walked in the field and then interacted with the men collecting the roses for processing. Then we went on to a facility that processes the rose oil--this facility was just opening (literally their opening day) and instead of eating in their café we joined a party which included peasant music and dancing which was a lot of fun. The visit there was OK, with a short tour, nice gift shop and small museum as well as rose gardens, but would probably not be repeated by another tour --not the party and the music anyway (we were just lucky). We then drove on to Kazanlak to visit the Thracian tomb - this turned out to be a big disappointment--there is no parking lot, the facility is poorly maintained, quite a hike up deterirorated concrete steps to a building where the tomb is only to find out that you cannot go into the building--then you go to a nearby underground site with a replica (big enough to hold three or four people at a time) where you pay 5 Euros for the right to take a picture. I would rate this tour no better than 3 stars. On the way back to Sofia two of our party wanted to eat so we stopped and they ate at a Kentucky Fried Chicken spot at a gas station while the rest of us waited for them. The guide will probably turn out to be a fine guide, but right now he is inexperienced. Traventuria would do better to visit the larger Thracian tomb site or better yet just not include it at all in their tours. We enjoyed the village and the Rose Valley (but out of season, which I believe is May-June, it probably wouldn't be worth a visit). Traventuria has a tour to the village and another that combines the village and Plodiv - either would be enjoyable. 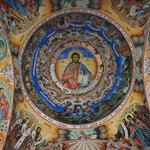 We typically don't do tours, except day tours occasionally, but the Rila Monastery trip encourages us to do more. Traventuria has a tour to Albania and Macedonia which are two countries we'd like to visit so we will consider this for next year. Thank you for the feedback. As a manager of the company I like the critics as much as the praises. Thank you for the kind words for the tour to Rila Monastery and Ani - your guide. I would however make a remark that we do not sell private tours (except a full day tour of Sofia). 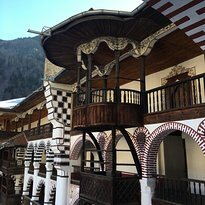 Rila Monastery tour as well as the Koprivshtitsa and the Valley of Roses are small group tours, which we try to keep the number of passengers up to 8, so there is still personal attitude towards all the clients. But obviously the tour to the Rose Valley did not run as to the standards of our company, for which I apologise. We include the Kazanluk Thracian Tomb, not that it is a gigantic monument, but because it is in the UNESCO list, displays special Thracian frescoes from the 4th century BC and it is only a few km from the Rose rafinery that you were visiting. We also do not offer tours to Macedonia, neither to Albania, but definately these tour countries are still not spoiled by massive tourism and are worth visiting. Once again I would like to express my gratefulness for sharing your experience with us on our Tripadvisor page. Best wishes from me and my team. Following our recent visit to Bulgaria I would like to strongly recommend Traventuria as an excellent company to organise accomadation and day tours. The guides and drivers are excellent and we certainly learned a lot about the country. The countryside is beautiful and Sofia as a base to stay is lively and easy to navigate on foot. On my recent (and first) visit to Bulgaria, I was lucky to see visit a number of key attractions, such as the Boyana Church, the Rila Monastery, and the Old Town in Plovdiv. At these locations, we were touring on our own or touring with friends, and while we were great company for each other, we probably missed out on a lot of interesting history and trivia about these locations. Not "probably" - we "definitely" missed out, as exemplified by our informative tour of Sofia. During our visit to Sofia, a tour of downtown Sofia was arranged for us through Traventuria. For two to three hours, we embarked on a fascinating walking tour around the landmarks at the heart of Sofia ending at the glorious Alexander Nevsky cathedral. Our guide Svetoslav provided enough historical background for me to mentally reconstruct an understanding of how Sofia came to be (and frankly, prior to my visit, much of my knowledge of Bulgarian history revolved around the success of the soccer team at the 1994 World Cup). At the same time, however, he did not bore us to death with minutia but rather injected a healthy dose of humor and interesting anecdotes about how things had changed over time, during times of the Roman, Ottoman, and Russian empires as well as the days of the communist regime. And he was very candid in providing different perspectives from each time period. My only regret is that we did not have Svetoslav (or someone else from Traventuria) when we visited the other historical sites, as we would have come back with a lot more knowledge, a lot fewer questions, and perhaps would have seen things that we simply missed because we did not know to look for them. Highly recommended. Took two day trips with Traventuria when visiting Sofia. The guides were very professional and lovely. Didn't expect it at all, but the day tours turned out to be a private tours for me and the friend I was travelling with. Besides showing us the sites on the programme, the guides had great advice about what to do around Sofia, where to buy and eat and were also very flexible about the schedule. Even took us "off the beaten path". I left Bulgaria with a taste for more and a great part of that were the Traventuria day trips, so I highly recommend it! I am more than happy with Traventuria! They were very punctual and did as they promise! I recommend visiting Rila Monastery and Boyana Church! It is a must if you go to Bulgaria and Traventuria is the perfect people to travel with! Our tour to the Rila Monastery and Boyana Church was truly memorable. With only one day to spend sightseeing in Bulgaria it was a comfortable and economical way to squeeze in two incredible UNESCO sites. Simon, our driver, picked us up from our hotel on time and, although he wasn't officially a guide, was friendly and informative throughout our day. Lunch was delicious - fresh fish in a local restaurant - but the real treat was getting to hike up to the Chapel of St Ivan of Rila after spending two hours at the monastery. The Rila Monastery and Boyana Church are not to be missed and I highly recommend this tour to anyone visiting Sophia.